I was contacted by Timothy Gassen recently. You remember him. He wrote Red, White & Blues: A Personal History of the Indianapolis Racers 1974-1979 back in 2007. 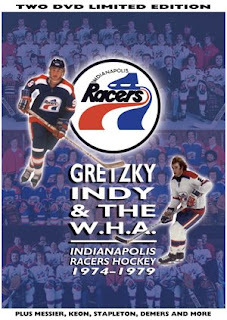 Yes, the same Indianapolis Racers that Wayne Gretzky began his professional career with. Gassen's back in 2009, this time with the limited edition 2 DVD set Gretzky, Indy and the WHA. The world premiere public screening is going to be at the Hockey Hall of Fame on May 16th, 2009. The DVD is already available for sale. Gassen sent me a copy to review, and I will soon. I have taken a sneak peek and I have to say it is of the highest professional quality. Disc one has a 50 minute documentary on the history of the Racers, including the involvement of the very young Wayne Gretzky and Mark Messier. Highlights, fight videos, interviews and audio files of WHA radio broadcasts. You can also use the disc to print off Gassen's revised 155 page book. Disc two features two games. The first is from December 1978. It is the Racers' final franchise victory, and it comes against the Edmonton Oilers. It is the only game Wayne Gretzky competed in against the Racers. The second video is the third period of a Racers-Cincinnati Stingers game from April 4th, 1978.